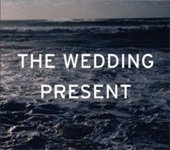 Camden Deluxe Records released a new Wedding Present compilation on 10 December 2007. This fifteen track album brings together RCA recordings carefully selected by David Gedge from the band's Bizarro and Seamonsters LPs, Top 40 singles from 1992's Hit Parade series, a couple of noteworthy B-sides and a recently unearthed and previously unreleased demo version of Bizarro track 'Be Honest'. The album also includes the band's spirited version of Cockney Rebel's 'Come Up And See Me (Make Me Smile)'. The complete track-listing is: Kennedy; Bewitched; Brassneck; Don't Talk, Just Kiss; Make Me Smile (Come Up And See Me); Dalliance; Dare; Corduroy; Heather; Blue Eyes; California; Come Play With Me; The Queen Of Outer Space; Flying Saucer; Be Honest (Electric Version). The album also comes with an eight page booklet featuring extensive sleevenotes by acclaimed writer and radio presenter Steve Lamacq. There have been one or two changes to the concert dates on The Wedding Present's 'George Best 20th Anniversary Tour' [at which the band's debut LP will be played live (in its entirety) as part of the set each night]. The Nottingham concert on 28 October has been moved from The Rescue Rooms to Rock City and the band would like to apologise for any inconvenience this might have caused. Please note that the shows at London Koko, London ULU and Portsmouth Wedgewood Rooms have now all sold out but, due to popular demand, a third London concert has now been added at Islington Academy on Sunday 18 November. We regret to announce that our old friends Scanners will not be supporting the band in Belfast, Galway and Dublin as originally planned. The new support group for these dates is Dae Kim and we are looking forward to meeting them. Finally, The Cardinals have been added to the bill at Manchester University on October 26th. For a full list of the dates and support bands, please visit the tour page of this web site. The Wedding Present are about to release a double CD of live recordings from 1987, the year that their classic debut album 'George Best' was released. 'LIVE 1987' compiles the first two of The Wedding Present's popular 'Live Tapes', a series of official bootleg cassettes that the band sold by mail order in the 1980s. These rare recordings were not available anywhere else and were eagerly collected by fans. 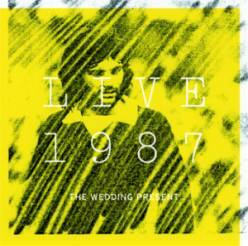 This newly re-mastered two-disc set features live versions of ten songs from 'George Best' and comes with sleeve notes written by The Wedding Present's original drummer, Shaun Charman, who was the band's main archivist at the time and recorded the original live tapes from the mixing desk. All the dates on The Wedding Present's 'George Best 20th Anniversary Tour' [at which the LP will be played live (in its entirety) as part of the set each night] are now fully confirmed. Although the original idea behind this series of concerts was to simply revisit the towns played on the original George Best tour of 1987, the concept has proved to be so popular that the band decided to extend the tour. The group are particularly happy to be returning to Wales for the first time in over a decade and that the 'Tour Finale' will now be in Yorkshire, at one of their favourite venues, The Sheffield Leadmill. Plans are also being made to film the concert in Dublin with a view to a possible future DVD release. Please note, however, that the concert in Angers has been switched to Bordeaux, and that further shows have now been confirmed in Grenoble and Wiesbaden. The concert at Koko in London has also now sold out, but tickets are still available for the ULU concert in London on 19 November. Of all the venues on this outing, ULU is the only one which was actually played by The Wedding Present as part of the original George Best tour in 1987. David Gedge has contributed to The Carling Weekend Reading Festival Book by Ian Carroll which will be published by Reynolds & Hearn on Friday 31 August 2007. The book, which is being launched at this year's Reading Festival on 24 August 2007 covers the legendary festival year by year through the eyes of festival-goers, staff and over five hundred artists. The book can be pre-ordered at Play.com, WH Smith, Amazon, Waterstones and Tesco. Sanctuary Records will release two collections of John Peel Sessions recorded by David Gedge's 'other' band, Cinerama on Monday 20 August 2007. 'John Peel Sessions: Season 3' is a twelve track CD forming the third and final instalment in the series of Peel Sessions albums instigated by Scopitones and Manifesto Records in 2001. The previous releases were 'John Peel Sessions' and 'John Peel Sessions: Season 2'. The track listing of this new compilation is: Your Time Starts Now [Live Version], And When She Was Bad [Live Version], Get Up And Go [Live Version], Spangle [Live Version], I'm From Further North Than You, Larry's, On / Off, All The Things She Said, Always The Quiet One, Mars Sparkles Down On Me, Nickels And Dimes and Groovejet [If This Ain't Love]. This release is primarily intended for people who do not wish to buy the boxed set mentioned below because they already have the first two albums in this series. 'The Complete Peel Sessions' is a boxed set which combines 'John Peel Sessions: Season 3' [see above] with its two predecessors, 'John Peel Sessions' and 'John Peel Sessions: Season 2' and forms the perfect companion to Sanctuary's recent release: 'The Wedding Present: The Complete Peel Sessions'. David Gedge had a very special relationship with John Peel, and although The Wedding Present's renown tends to eclipse that of Cinerama, between 1998 and 2004 Cinerama recorded multiple sessions for the legendary BBC DJ. This three disc release features thirty six tracks from the band. Most are originals but also included are some unique cover versions; a heart-rending 'Yesterday Once More' (yes, The Carpenters one), Spiller's 'Groovejet', t.A.T.u. 's 'All The Things She Said' and The Turtles' 1968 hit 'Elenore', a song much loved by Peel himself and recorded for him as a sixtieth birthday present. The compilation, remastering and artwork of this substantial set has been carried out under the close supervision of David Gedge and the package also contains extensive sleeve notes by acclaimed writer and broadcaster Andrew Collins. a full list of the confirmed dates. 'Skills Like This' the independent feature film featuring two Wedding Present songs in the soundtrack, will have its international premiere at the Edinburgh Film Festival in August. The movie, which is directed by Monty Miranda from Denver, Colorado, will have two public screenings and one industry screening and compete in the 'Rosebud' category for the Skillset New Directors Award. The industry screening is at 09:00 on the 19th of August at Filmhouse 2 and the public screenings are at 21:40 on the 21st at Filmhouse 1 and 19:40 on the 24th at Filmhouse 2. Please visit http://www.skillslikethis.com/ for further details. Tickets for the tour are selling so well that the band are currently considering further concerts in London, Cardiff, Dublin and Belfast. There are already plans to take the show [during which the album will be played in its entirety as part of the set each night] to Continental Europe. For a list of the confirmed dates so far [in which the band are revisiting each of the towns played on the original George Best tour of 1987] please visit the tour page of this site. The Wedding Present will be playing on the first night of "Doncaster Live 2007," a free weekend music festival that takes place at various venues around the town centre of Doncaster in Yorkshire on Saturday the 21st and Sunday the 22nd of July. The event, which is in its third year, starts at 10AM and will finish around 11.30PM. Together with street performers and DJs, other bands performing are: Ego Parade, Vegas Child, OPM, Tiny Dancer and The Paddingtons. For further information about the event, please contact the Town Centre & Markets Event Team on 01302 762478. The Wedding Present will be playing a series of concert dates in October 2007 to commemorate the twentieth anniversary of the release of their debut album, George Best. For the British leg of the tour the band will revisit each of the towns played on the original George Best tour of 1987. Furthermore, the album will be played in its entirety as part of the set each night. Please visit the tour page for details of all the concerts that have been confirmed so far. It has come to our attention that some of the booklets included in the recently released Wedding Present Peel Sessions Boxed Set have been misprinted. In the section which contains the table of musical contributors [painstakingly put together by David himself!] a page has been printed twice by mistake. Sanctuary Records have printed some extra versions of the correct booklet, so a replacement copy should be obtainable. Sanctuary Records will be releasing all of The Wedding Present's sessions for the late John Peel on Monday 26th March 2007. This box set effectively traces the history of The Wedding Present as much as it does their close relationship with the legendary radio presenter, who continually championed the band on his long running BBC Radio 1 show. Commencing with their first session from 1986, it introduces their trademark fast guitars and David Gedge's idiosyncratic song writing. That first session also begins a trend for the group of recording unlikely and compelling cover versions - in this case, Orange Juice's "Felicity". Elsewhere you'll hear renditions of Altered Images' "Happy Birthday" and the "White Horses" TV theme, amongst others. The Wedding Present went on to record twelve studio sessions for Peel, the last of which [in 2004] previewed songs from the then, forthcoming Take Fountain album. The six disc set falls neatly into three CDs of studio sessions and three representing live performances. The former includes their third session from May 1987, which previewed songs from the George Best album six months before it's release, and the band's bizarre excursion into the world of Ukrainian folk music, inspired by guitarist Peter Solowka. The live sessions section comprises their performance for John Peel's 50th Birthday Party in August 1989 plus sets from the Leeds Sounds City, Phoenix and Reading Festivals. The compilation, remastering and artwork has all been carried out under the close supervision of David Gedge and the release comes with extensive sleeve notes by Ken Garner, writer of: "In Session Tonight", the definitive guide to live pop and rock on BBC Radio. The Wedding Present are pleased to announce that the support group for their forthcoming Yorkshire dates will be The Hot Puppies. For more details of the concerts, please visit the TOURS page. Everyone here at Scopitones would like to wish everyone out there a very happy and healthy New Year. Although there will be considerably fewer Wedding Present concerts in 2007 than there have been in the last couple of years, there will still be some interesting record releases, so please stay tuned!